This program is an in-depth study of foundational yoga that spans over six weekends. Areas of focus include yoga asana, philosophy, anatomy, prenatal yoga, assisting, ayurveda, sanskrit, mantra and meditation. Japa Meditation and Mantra Practices with Wah! *Payment plans for special circumstances can be made available upon request. 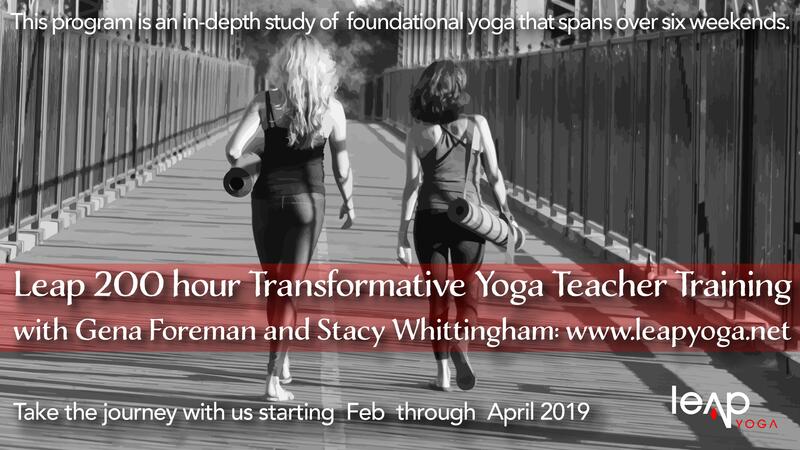 200-hr Certified Yoga Teacher Certification (pending all program requirements are met), Transformative Yoga Teacher Training Manual, guest teacher workshops, and all excursions. If a student withdraws from the course: 31+ days prior to training, full refund minus deposit 15-30 days prior to training, 50% of training balance, minus $400 deposit 14 days prior to training, no refund Once training begins: no refund. Serious yoga students are invited to attend this training for the purposes of advanced study without fulfilling all requirements for 200 HR certification. This certification is available to yoga students who wish to teach yoga in public venues such as studios, corporate yoga, recovery programs, and gyms. Consistent classroom participation, successful completion of assigned reading, demonstration of understanding principles presented in the program, and fulfillment of practice teaching requirements factors your eligibility for certification through Yoga Alliance. This Hatha Yoga 200 HR Teacher Training and Deeper Studies Program is designed for experienced students who would like to achieve a 200 HR Yoga Alliance Certification for the purpose of teaching yoga classes and also for the serious yoga practitioner desiring to deepen his/her understanding of the science of yoga. This comprehensive curriculum will include the fundamentals of yoga philosophy, teaching methods, and developing skills for working with a diverse array of yoga practitioners in aspects of postural, breathing, mantra, and meditation practices. Asana Technique, Teaching Methods and Practical Yoga Anatomy: Participants will learn to teach the primary families of asanas: Sun Salutations, Standing Poses, Backbends, Forward Bends, Twists, Arm Balances, Inversions, Core Refinement, and Hip Openers. Explorations of postures and poses will be supported by functional anatomy, bio-mechanics, and the kinesiology of movement. In this section participants will also learn how to see yoga practitioners in order to guide them in a meaningful and safe way through an asana practice. Studies of alignment principles, modifications, physical adjustments/assists, and the use of yoga props are all included in this section. Practical Yoga History and Philosophy: This section includes the study of certain yoga philosophies and traditional texts. Studies include; Patanjali’s Eight Limbs of Yoga, Yoga Sutras, Patanjali’s philoposphy of Spiritual Psychology, an overview of the Bahagavd Gita, history of yoga, and an introduction to the use of Sanskrit. Class Plan and Sequencing: This section of study will include art and science of sequencing postures for yoga classes. Class plan instruction will include grounding practices, intention setting, themes, and styles of asana practice. Seeing, Relating, Demonstrating, Cuing: We learn to observe, appreciate, and understand what is happening with different students to develop the skills to work with all bodies and abilities. How to effectively demonstrate yoga poses while giving clear concise instructions using the qualities of voice, tone, and audibility. Practice Teaching: Participants will be working together in group settings to practice teach. Students will learn to develop confidence and skills to lead larger classes. Each practice teaching session includes feedback and discussion of teaching techniques and methods. Teaching Pranayama: This section includes instruction of basic breathing techniques; three-part breathing and ujayi breath along with intermediate breathing techniques such as alternate nostril, sitali, kapalabhati, bhramari. Meditation Practice: We will explore several meditation techniques including japa meditation, guided meditation, silent meditation, and walking meditation. Subtle Energetic Body and Ayurveda: The subtle energetic body is the template to the physical body and in this section we will cover nadis, koshas, bandhas, chakras, and the vayus. Included in this section is an introduction to Ayurveda, the five elements, doshas, gunas, and dinacharaya. Pre-Natal Yoga: In this section participants will learn how to adapt the practice for each trimester of pregnancy, indications and contra-indications for various conditions, effective use of props, emotional and psychological aspects of pre-natal, preparation, delivery and post-partum reintegration through yoga. Lifestyle, Ethics, and Selfless Service: In this section we will be exploring the bigger picture of how we live our lives off the mat. We will explore nutrition, personal yoga and meditation practice, relations with family, friends, co-workers and community. We will study the yogic perspective of living life with dignity, integrity, and respect for all beings. Please click link below, download application form, fill in and return to Leap.